If you are a teacher who has a curriculum for studies in immigration, immigration stories, and or intergenerational interviews, we invite you to share some of your best practices here. We will also add some links to lesson plans on the web. Please come back and visit, particularly if you are a teacher. Please leave a comment when you try something out and let us know how it worked out. Questions or suggestions, contact Editor@MadeIntoAmerica.org. Kathleen Gonzalez is an English teacher of Juniors and Seniors at Woodside Priory School in Woodside, CA. Her students’ work can be viewed at The Refugee Anthology. Contact Kathleen at: KGonzalez AT prioryca.org. I teach an upper division English course titled Literature of Witness. Besides reading and viewing witness texts, students become secondhand witnesses themselves by conducting their own interviews. Below is an overview of the assignment requirements and objectives, class activities, and suggestions for finding someone to interview. I introduce the assignment 4-6 before the rough draft is due so that students have time to find someone to interview, conduct the interview, and write it up in essay format. To connect an account you create to the other witness texts students are reading. Each student will interview a person who has been a war refugee or a combat veteran in order to hear and record a living witness account. Look for people who fled their country not by choice but for survival or to escape oppression or violence, or someone who experienced combat trauma in a battle situation. Students may also interview a survivor of genocide or witness to a traumatic event, such as 9/11. To find someone to interview, ask friends, family, neighbors, and teachers for suggestions of people they know. Also, contact local agencies that work with refugees. Choose someone who has witnessed a traumatic event. For our purposes, this should be a refugee (someone who had to flee his or her country or face imprisonment, torture, or death); a survivor of a genocide; a war veteran who saw combat. A few other ideas: someone who personally witnessed the 9/11 attack on the Twin Towers or a child soldier in Sierra Leone. The interview subject can be any age, but keep in mind that it should be someone who was old enough to have concrete memories. Don’t choose someone who was a toddler and doesn’t really remember the event. Do any necessary background research before the interview about the subject’s home country, the conflict he or she experienced, and the aftermath for survivors/refugees. Recalling these events can be traumatic. Be sure to choose someone who is willing to share memories. In many cases, witnesses are happy for the opportunity to share their stories because these were very meaningful events in their lives; however, be sensitive that for some people, it’s too difficult to talk about. Once the person has agreed to be interviewed, remember that this means he or she is willing, so you can feel confident about asking questions. Remember, it’s important to build trust with a subject before beginning to ask questions. Be prepared with small talk to ease into the interview. Also, consider bringing flowers or a muffin or sending a card as a follow-up show of gratitude. Interviews may be conducted in another language and then translated into English. The best interviews occur face to face in order to gather the emotional content of the interview as well–the facial expressions, gestures, and energy that builds. That being said, interviews and also be conducted via Skype (or another video platform) or by phone, but inserting imagery into the final essay will require some extra thought. As a class we’ll discuss tips, and there are sample interviews on www.refugeeanthology.org. Conduct the interview and write it in narrative format, including dialogue with direct quotations. The interview should include at least 5 open-ended questions and responses. Work on writing style! Incorporate 2 or more (total) of the following stylistic devices: alliteration, assonance, anaphora, asyndeton, or polysyndeton. Highlight or underline these. Write a rough draft and have it read by a classmate who will complete a response sheet to give feedback. Then revise for the final draft. Final interview paper should be at least 4 pages long. It should also include some setting details and a description of the person being interviewed. Paper is typed following MLA format and correct dialogue punctuation. Turn in the draft and response with the final draft. a) How does this interview bear witness to a war or human rights event? Why is it important to record this event for history? b) How is this event meaningful to both the refugee as well as to others who hear this story? c) What truths does this testimony reveal? What is the value of this testimony? Read William Zinsser’s chapter “The Interview” from On Writing Well to learn techniques for conducting an interview and for capturing the best qualities and quotations when writing up the interview. The class will discuss Zinsser’s ideas, the pros and cons. a) What was engaging about this interview? What made you care about these people or this subject? b) What literary technique or element of style did this writer use that stood out to you? What might have improved it? c) Did this story feel like an “authentic” witness account? How? What made it authentic? Brainstorm questions as a class. These should be open-ended questions relating to the subject’s experiences and also relating to witness literature concepts. These will be posted electronically where all students can access the list. Students bring rough draft essays to class and do peer review. They use a response sheet to guide their review, and then use the feedback to improve the writing for their final draft. I also read portions of the paper at this time and provide feedback, and we discuss literary devices like voice, tone, and style. Students receive the scoring rubric at this time as well so they’ll know how they’re being evaluated. a) What did you learn about being a refugee? How does this relate to being a “witness,” as in “someone who writes/records an account of an atrocity”? b) What are the lessons for our local community? What are the lessons for our global community? What personal insights did you gather, things that affect your worldview or daily living? c) What was the hardest part of doing this interview? What would you do differently? Or what advice do you have for future students? d) You have now written a piece of witness literature! How are you a witness? Refer to the “key assumptions” defining witness literature. e) Did you get a sense of the authenticity of this witness’s account? How do you know how “true” this account is? Do you feel like you captured both the literal and emotional truth of this person’s experience? If you focused more on one of these, why did that happen? Students turn in their final drafts, I score them on the rubric and give feedback, then return the papers. Students are not required to submit their papers to the website; I’ve found there are varying levels of anonymity necessary for their subjects, plus some students are just more excited by sharing their project publicly. So if they are going to submit it for the website, they take my rubric and feedback, make revisions, and email the revised version to me. I read the paper one last time to check for typos before putting it on the website. Emily Lee is an English teacher and Nanor Balabanian is a History teacher at Everest Public High School – a Summit charter High School in Redwood City, CA. 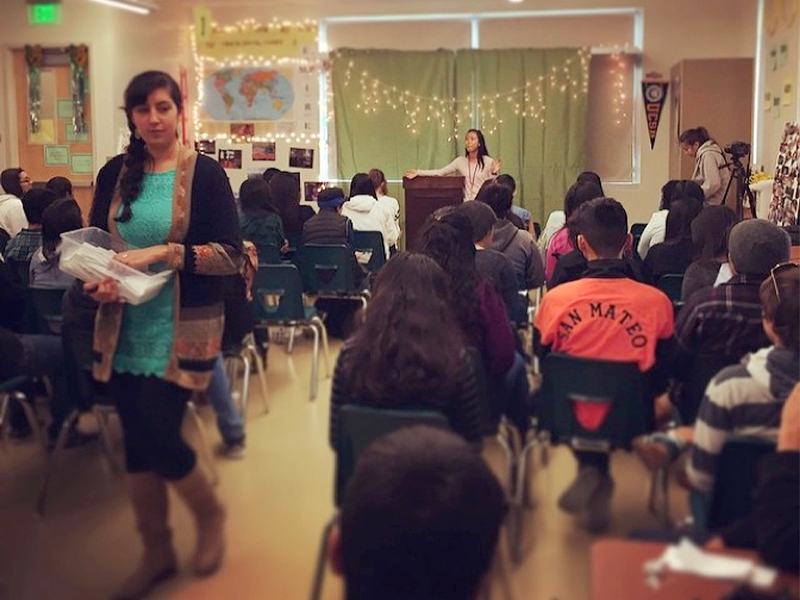 We are 9th grade English and History teachers at a small charter school in California that serves many first-generation students. As teachers of color and immigrants, we felt we had a responsibility to bring these issues in our classrooms and engage in personal reflection and analysis. We collaborated with Elliot Margolies, director of the “Made Into America” project. In our two-week humanities project, students investigated and wrote the immigration story of one of their family members to be published on the Made Into America online archive. The inherently authentic nature of the task lent itself to strong student investment and writing products. Our project spanned eight instructional hours; however, it is very adaptable. We used the traditional steps of the writing process. Students engaged in an interview workshop where they teased out elements of a good story and interviewing techniques. 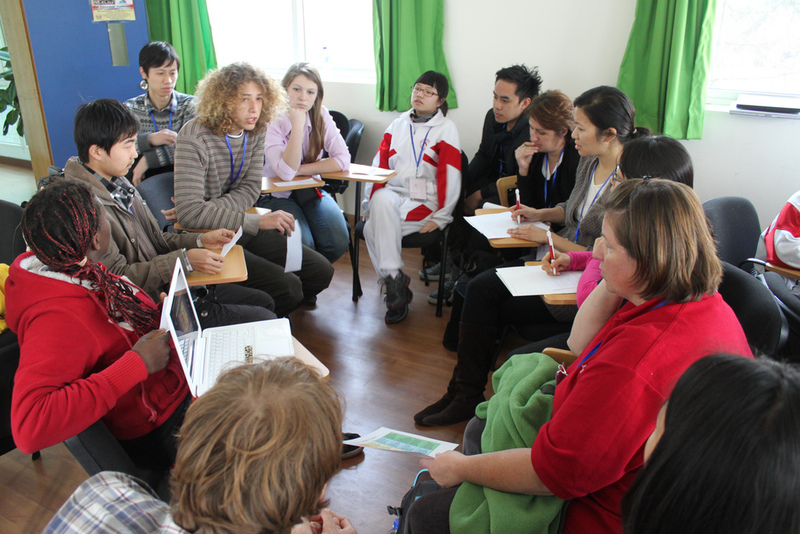 In this workshop, they learned how to ask poignant follow-up questions to gain rich, provoking, detailed responses. For example, students learned that when the interviewee’s intonation changes, or they start to give quirky, memorable details from their journey, then they should ask, “tell me more.” Then, students applied and practiced these techniques by writing questions and interviewing on Skype a Syrian refugee who recently emigrated to Lebanon. (This can also be done by inviting an immigrant parent or a guest as an interviewee). Using techniques learned from the interview workshop, students wrote questions to use to conduct interviews of their family member. Before writing their own questions, students examined an example story that one of the teachers us wrote in order to understand the end goal of their interview. We encouraged students to conduct and transcribe their interview in their home language. 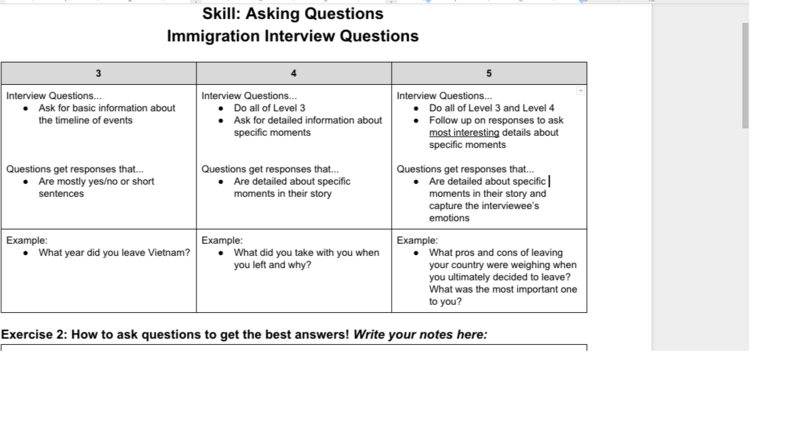 In order to guide students in their interviews, we asked them to divide the immigration story into five main parts: 1) Life in original country, 2) Why they decided to leave, 3) How they left, 4) Arriving in America, and 5) Where they are now and hopes for the future. We encouraged students to cover each part in their story, but emphasized that each story is unique with different parts that are longer and more detailed than others. To organize their interview responses, students copy-pasted their interview into each part of the outline. Students examined point-of-view and “tried on” different points-of-view (1st or 3rd person perspective) before settling on the one that most powerfully conveys their story. Students creatively embedded non-English quotations from their interviews. Students peer reviewed and finalized their drafts. A few days prior to the celebration, we sent out invitations and cards with the students to give to their interviewees. The goal for this celebration was to honor the immigrants, the interviewees and their families. During the sharing activity, students sat in a circle and shared one part of their story. With a 30-person classroom, each student got a minute to share part of their story. At the end, students shared overall reflections and learning experiences with one another. It was a powerful and collective way to end this project. English as a Second Language programs, and public workshops. We’ve included some excerpts below from the toolkit for college classes. You can see and download all 3 tookits here. You can view the digital stories here. You can contact the project here. Immigrant Stories curriculum has been used in a variety of courses focused on migration and/or personal narratives. The project does not replace your course content. Instead, students work on their digital stories in several stages throughout the semester. This toolkit includes everything that you will need to implement Immigrant Stories in your course, such as a schedule for a 15-week course, lesson plans (one to teach scriptwriting and one for recording and editing video), a grading rubric, and a student resource packet. The packet contains information about writing a script, basic instructions for audio and video editing software, and worksheets to help students stay organized. expensive for individuals to create their own short films. Digital stories may be created from a combination of digital images, text, sound, and video. voiceover or in a video recording. They edit their recording into a multimedia video and may add scanned or digital photographs, video clips, onscreen text, background music, and special effects. Digital stories are powerful, multilayered narratives that have become increasingly popular tools foreducation, self-expression, and public dialogue. Learning Outcomes: Students will learn about the components of a digital story, how to analyze a digital story, and how to write a script for their own story. How did the creator communicate their story? What would it tell people in the future about immigration?